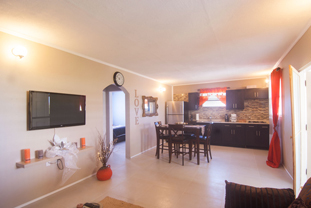 Dolphin valley apartment is located at the Atlantic side of St. Eustatius. This two bedroom apartment is fully equipped. You get a large two bedroom vacation rental with queen size beds, living and dining area, a fully equipped kitchen with refrigerator, stove, oven, microwave and Wifi, bathroom with shower.